Video poker started out super simple - basic Jacks or Better machines that allowed you to play one hand at a time. However, since then video poker has expanded and developed faster than you can imagine. Now there are hundreds of different variations that can all be played one hand at a time or one hundred hands at a time! This page is going to make you an expert on video poker games and variations. Read on to learn more. The first topic we'll cover is that of machine types. In the old days there was only one machine type, and that was the single play machine. However, now there are single play, multi play, and even other crazy variations that can confuse a new video poker player. The term "single play" means you play one single hand at a time. The term "multi play" means that you can play more than one hand at a time. Multi play machines range from three-play all the way up to 100-play. 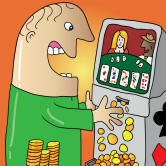 Multi play machines start out just like a normal single play game - you are dealt a five card poker hand. Then, you choose which cards you'd like to hold, and click Draw to receive your new cards. After you click Draw on a multi-play machine, your hand is actually split into as many hands as you selected (three hands on a three play game, five hands on a five play game, etc) and the draw is run independently for each hand. The cards you initially held are the same on each hand, but the draw will provide each hand with different cards. If you'd like a full explanation with examples, read our multi-play video poker article. Remember that each of the above video poker games can be played in any of the machine types we discussed above. Read this article for help choosing a video poker game. There are a few other topics that you need to know about before you're a video poker expert. First of all, there are also "progressive" video poker machines which are different from anything we discussed above. On a progressive machine, a small portion of every bet is kept by the casino and added to a jackpot, which is displayed over the top of the machine. Multiple machines contribute to the jackpot, and when someone hits a Royal Flush on one of the progressive machines they win the jackpot. For a full explanation of progressive machines and when they're profitable, read our progressive video poker guide.